RALEIGH, N.C. — A powerful Hurricane Earl threatened to sideswipe much of the East Coast just ahead of Labor Day, worrying countless vacationers who planned to spend the traditional last week of summer at the beach. 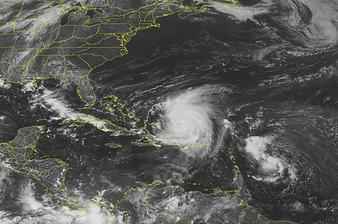 The Federal Emergency Management Agency warned people along the Eastern Seaboard to prepare for possible evacuations and islanders in the Turks and Caicos hunkered down in their homes Tuesday as the Category 4 hurricane steamed across the Caribbean with winds of 135 mph. Earl was expected to remain over the open ocean before turning north and running parallel to the East Coast, bringing high winds and heavy rain to North Carolina's Outer Banks by late Thursday or early Friday. From there, forecasters said, it could curve away from the coast somewhat as it makes it way north, perhaps hitting Massachusetts' Cape Cod and the Maine shoreline on Friday night and Saturday. "My guests are calling and they don't know what to do and I don't know what to tell them," said Dave Dawson, owner of the oceanfront Cape Hatteras Motel in Buxton, N.C. Forecasters cautioned that it was still too early to tell how close Earl might come to land. But not since Hurricane Bob in 1991 has such a powerful storm had such a large swath of the East Coast in its sights, said Dennis Feltgen, spokesman for the National Hurricane Center.